I sat weeping on the bathroom floor, riddled with chronic exhaustion and the inner torment of not living up to my potential. My ‘failure’ hit me like a ton of repo’d Jimmy Choos. The pain and shame of having my company stolen and losing everything I’d worked so hard for brought a tidal wave of ancestral wounding to the forefront of my life. All of the family and money karma drama that I’d pushed down and ignored for so long came bubbling right back up. I surrendered to the Divine. I pleaded for help in uncovering, dismantling, and reprogramming all the toxic junk I was storing in my body that I knew on some level would forever block me from success. If you’ve ever found yourself feeling utterly hopeless with nothing left to lose, you can imagine how liberating it was to simply let go and let the Divine take the wheel. I was led on the most profound healing journey of my life. The pain, shame, scarcity, money karma drama, and ancestral wounding was finally being cleared, released, and transformed into pure divine strength. 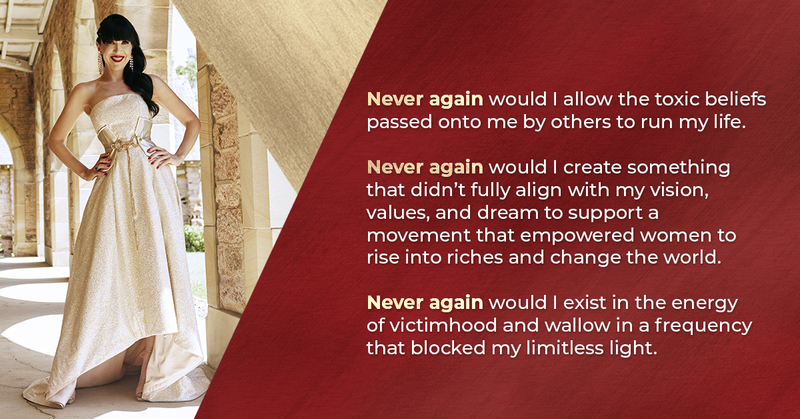 Once I shifted my frequency, released my karmic ancestral wounding, and transformed my beliefs from limiting to limitless, I was able to rise up and build a 7-figure EMPIRE supporting visionary women like you to do the same. If you had told me in my darkest hour that a million dollar business built around my soul’s highest calling was in my future, I would’ve tossed you in the bathtub. … With that in mind, I want you to consciously set aside your skepticism and imagine for a moment that you very well *could* transcend from a life of scarcity and shine your light for all to see (all while getting really righteously rich). I believe in full honesty — which is why I’ll tell you straight up that my journey from rock bottom to limitless abundance wasn’t easy. It took years for me to figure out exactly HOW to let go of the junk that was cluttering my path to transcend to profit and purpose. I searched and searched for someone to help me who’d been there and done that, but that person never showed up. I had to figure it all out on my own — everything from transforming my belief system and releasing the sh*t my family imprinted on me from a young age, to packaging, positioning, and pricing my services as a healer. There’s no doubt in my mind that you can do the same. … or you can take the shortcut I’ve created for you based on my own experience and my one-on-one work helping hundreds of radiantly revolutionary women build their empires. Until now, the most affordable way of working with me was a minimum investment of $3800. But for a limited time, I’m opening up my Rich Diva Millionista program — a step-by-step energetic guide to making money and abundance from your own creatrix power. This is the most accessible way to learn from me. You’ll learn to shift your energy, shed your limitations, and build the sacred and abundant business you deeply desire. you’re stuck in scarcity and subservient, people-pleasing BS even though you KNOW deep down that you were made for more. pain, shame, and victimhood aren’t doing you any favors, and you’re ready to energetically shift your frequency to one of lushness, luxurious joy, freedom, and abundance. 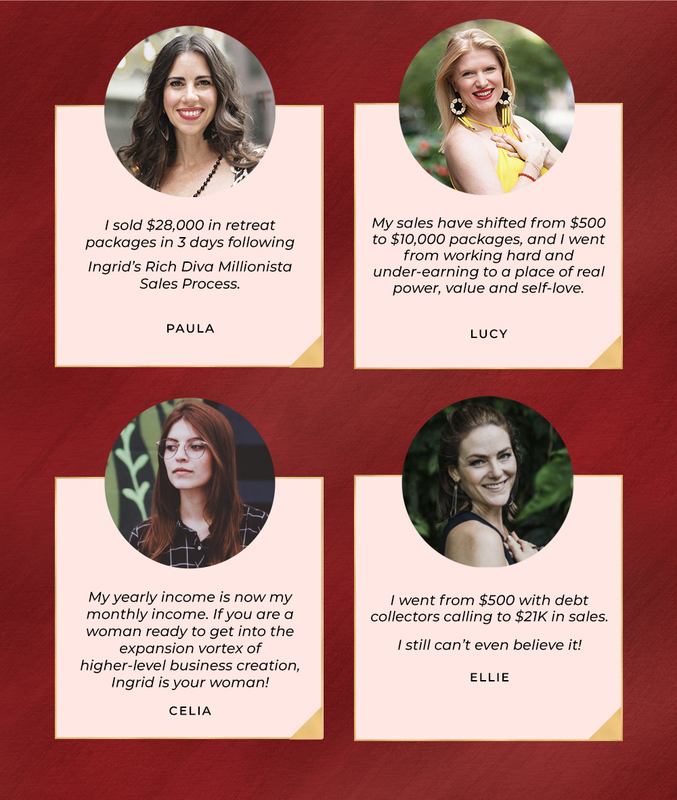 you want a proven blueprint to take your business from petite to profitable, purposeful, and hugely impactful in a beautiful and streamlined way (straining your hustle muscle is *not* required). ⇒ The Rich Diva Millionista Masterclass: launch into money and magic with this full power, 2-hour packaging, positioning, and deep sales masterclass. My private clients are paying $10,000+ to get this content. This training is loaded with tips on how to master the sales process and draw in more clients with a heck load more ease. … If you’ve ever wondered how successful coaches and healers demand big bucks for their high-ticket offers, this is for you. VALUE: $997… but really, priceless! ⇒ BONUS #1: The Million Dollar Diva Priestess Code Series: 6 Proven paradigm shifting healings, meditations, and activations to rewire your brain and energetically heal yourself for good — because you don’t get the dosh without doing the inner work first. ⇒ BONUS #2: The Money Miracle Matrix Workbook: This workbook will help you invoke and energetically connect to your desire, so you can create it immediately! ⇒ BONUS #3: Slay, Pray, and Hit Your Payday: 5 Divine Femme Sacred Audio Healings. Think meditations audio powered by magical rocket fuel. This is a program in itself! Each theta-healing download comes with a follow along invocation, so you can chant simultaneously to completely embody a new frequency. Rise into a potent vibration of love, riches and illumination as you radically heal your relationship with money, your worth and value as a woman. WOOT! This is over $3500 in epic value for just one-payment of $497 OR get started today for just $197. I was serious when I told you this was an accessible and transformational opportunity to release yourself from pain, shame, and scarcity and rise into radical wealth and opportunity. When I picked myself up off the floor all those years ago after I called for divine help, I had no idea what the future would hold. But I trusted one person—myself—to make magic happen, and I owned my power as a creatrix from that moment forth. Now it’s your turn to choose yourself. Luckily, there’s never been a better time than right now to transform your bank account through healing yourself. To letting go of whatever is blocking your light and rising into divine riches and radiance! so they can claim their sacred power to lead, serve and build a legacy of divine wealth and global impact. sacrificing themselves and those they LOVE. 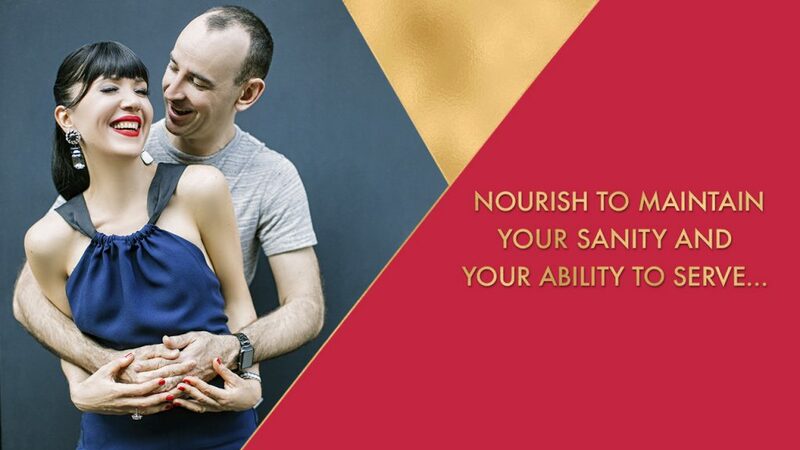 rich, nourishing life and business. 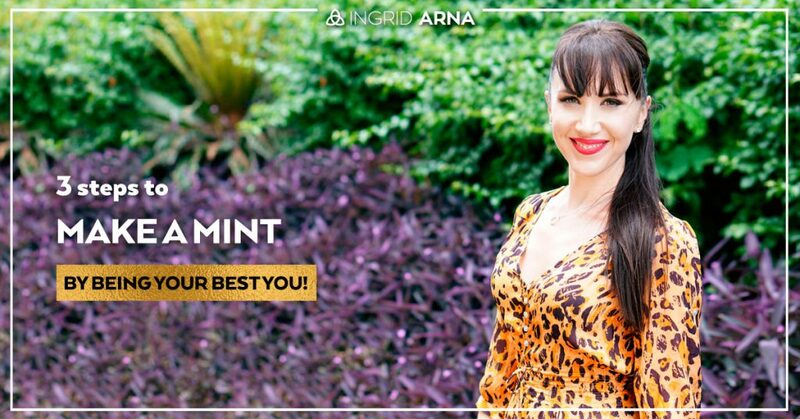 Ingrid’s work has landed coverage in broadcast outlets around the world, including Vogue, Cosmopolitan, InStyle, The Huffington Post, Good Health Magazine, Fox News and The Steve Harvey Show. 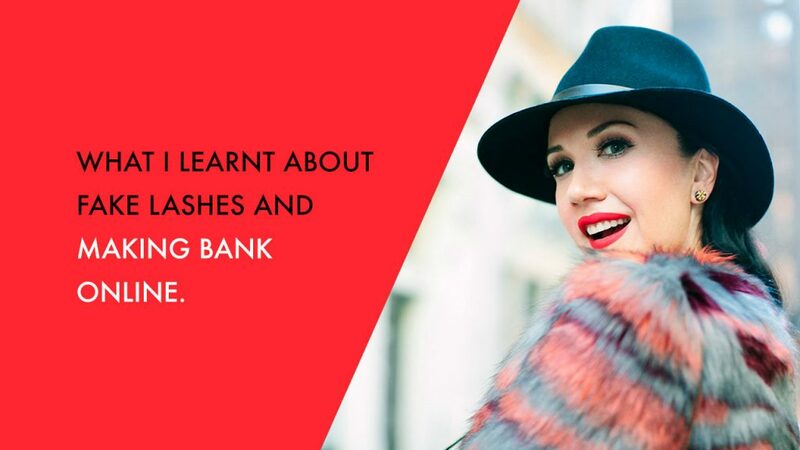 What I learnt about fake lashes and making bank online.